Emeril Lagasse had his trademark “BAM!” Rachael Ray goes with “Yumm-o,” and Anne Burrell chimes in again and again: “Brown food tastes good!” When they are overused these expressions get on my nerves, but I can’t argue with the importance of browning your food to pump up its flavor. So, what is happening to the food? 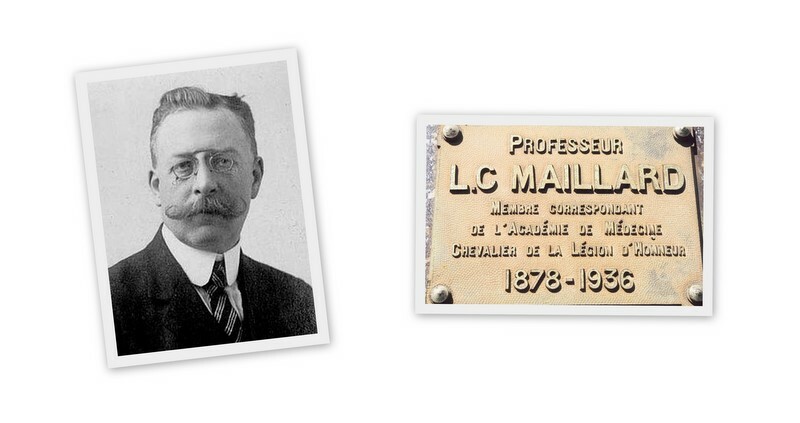 It all reduces to a series of chemical events known as the “Maillard reactions,”named after the French chemist who discovered them, Louis-Camille Maillard (pronounced “mah-yar”). Maillard reactions involve proteins and sugars. These molecules may react with each other if they contain atoms on their surfaces with a net positive or negative charge. Proteins consist of tens or hundreds of amino acids linked together, but the constituent amino acids of a native protein are not very reactive, because they fold into a stable 3-dimensional structure. However, subjecting the protein to high energy (heat) or a basic (high pH) environment destabilizes its structure, exposing the charges of many of its amino acids. If present, a sugar will react with the charged amino acids to produce all sorts of different compounds, many of which taste great! Note that boiling water won’t do the trick: the Maillard reactions need much higher heat, like in a skillet with hot oil, or on a grill. As we all know, these are the best approaches to browning foods. Caramelization and Maillard reactions are often used interchangeably, but this is wrong because the former refer to what happens to a sugar alone upon heating, whereas Maillard reactions always involve proteins and sugars. The two processes are cosmetically and conceptually similar, in that both produce a brown color, but they arise from different chemistry. That brings me to a recipe for caramelized carrot soup, in which just a few simple ingredients…. … come together to create an incredible depth of flavor. Here increasing both the heat (a pressure cooker works its magic), and the pH (baking soda to the rescue) optimizes the Maillard reactions. Chemistry never tasted so good! In a small bowl, mix the yogurt with tarragon, caraway seeds, a touch of salt and pepper, and reserve. In a pressure cooker, combine 4 tablespoons of the butter with the carrots and cook uncovered until the butter is melted. Stir in the salt and baking soda, cover and cook at full pressure for 10 minutes.Carefully move the pressure cooker to the sink and run cold water over the lid until the temperature drops down and the pressure is equalized (one minute under cold water will definitely be enough). Open the pressure cooker, add the carrot juice (or a mixture of carrot juice + water), and stir to release caramelized bits stuck to the bottom of the pan. Transfer the contents of the pan to a blender or food processor, add the ginger, the remaining 2 Tbs of butter, and puree until smooth. Season the soup with pepper and pour into bowls. Garnish with a small dollop of the reserved yogurt, sprinkle some fresh tarragon, and serve. Comments: Don’t be alarmed by the look of the carrot/butter mixture once you open the pressure cooker. The brown bits stuck to the pan will dissolve easily and they give this soup the most intense carrot flavor ever! The box of carrot juice I used had a little less than 2 cups so I completed the volume with water. If you have some V8 juice around the pantry, it could be a nice addition. This technique won me over, I wonder if other soups could benefit from this treatment. Caramelized broccoli? Butternut squash? Only future experiments will tell… 😉 At any rate, this will be my favorite soup recipe for the year 2011. Hands down! You know I love these chemistry classes Sally… trying to figure out where Maillard fits in with AGEs – the nutrition world is all abuzz about glycation and its pro-inflammatory effect on the body. In any event, your caramelized carrot soup looks pretty darn wonderful and how interesting with the caraway seeds! I don’t have a pressure cooker, Sally (long story). 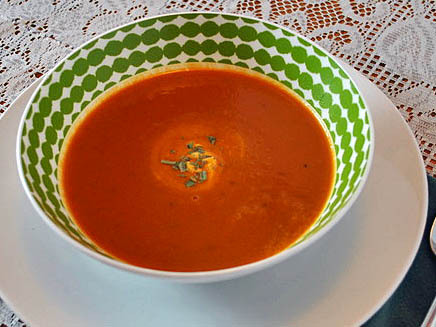 Can you suggest some other way to prepare this delicious-looking soup? I would be curious how to make this soup without a pressure cooker, too, as I don’t have one-yet! It looks so good! Thanks for all the inspiration and great recipes-I enjoyed reading about your LA adventure when you were in town, since I live in LA! I am again having trouble to address comments individually from my iPad, so here goes a general reply…. If you don’t have a pressure cooker, cook the carrots in the butter with the baking soda, use medium high heat, and move the contents every once I. a while, but allow the carrots to stay in contact with the bottom of the pan, forcing it to get dark in several spots before mixing. I would go for at least 30 minutes, but keeping an eye to make sure they don t. dry too much. Add a small amount of water if necessary. I should probably try it myself too, just for the sake of experimenting…. Wish I wasn’t terrified of my Lagostina Pressure Cooker. The last time I used it I can liquid seeping from it. What a clean up after lol. I think the heat was too high. My mother used the pressure cooker a lot when we were growing up. 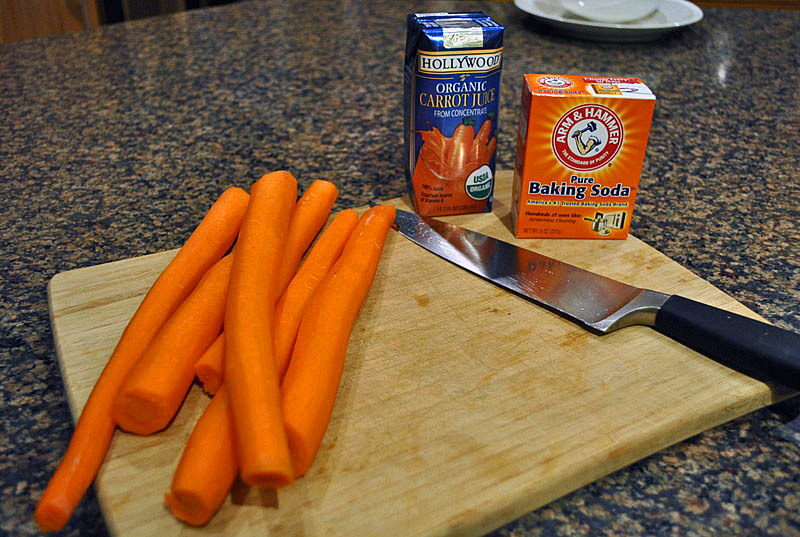 I love this and, aside from the carrot juice, usually have all these ingredients on hand. Just a great recipe. Hi Sally. It’s me again, back to nominate you or The Versatile Blogger award. It’s one of those things you pass on to fifteen others. But you get a link in my next post (out later today, I hope) and then get to reveal seven things about yourself to your readers. this soup sounds delicious. Caramelized carrots must make it taste almost like candy! Loved the chemistry lesson and the soup looks gorgeous!